Bring more customers to your etsy business with this strategy for finding interested and popular bloggers who will feature your shop. 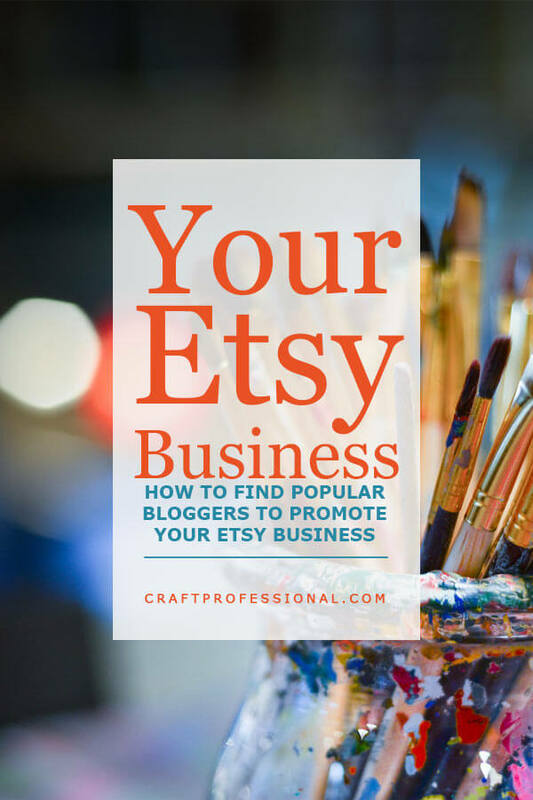 Do you want to find bloggers with good website traffic to promote your Etsy business? Of course you do! I use Feedly to follow my favorite blogs. It's an extremely useful tool to help you stay on top of your niche. But it can also be useful for finding popular bloggers in your niche who would be receptive to promoting your Etsy business. First, go to feedly.com. If you have a Feedly account, make sure you're signed in. If you don't have one, create your free Feedly account. There is an affordable, paid pro version of Feedly with some cool features. I've used the free version for years, and, although I would like some of the paid features, the free version does meet all of my most important needs. Once you're signed into Feedly, it's time to look for popular bloggers who might be interested in promoting your products. Start by brainstorming the types of bloggers who might be interested in promoting your Etsy business. Ask yourself what type of blog they might write, and what main keywords they might focus on. For example, imagine you make adorable handmade dog bowls, the most obvious bloggers to target would be those who focus on dogs specifically, or pets in general. Some keywords you might search are dog, pet, or puppy. Choose a keyword, and type it into Feedly's search bar. It's on the top right of the Feedly web page. Click your cursor in the search box, and type your keyword. In this case, we're searching "dog" related blogs. You might see a few choices pop up. Select "dog websites" under the heading Find New Sources. Of course, it won't always say "dog websites." It will replace the word "dog" with whatever search keyword you used. If you don't select "dog websites" and just hit enter, you'll get a pop up message asking you to pay for Feedly pro. Then, if you're like me, you'll get confused and annoyed and wonder why their search bar doesn't work. It works. You just can't rush through the steps, and you have to choose the right options. Once you've searched for websites featuring your keyword, you'll get a long list of results. Start scrolling through them and look for sites that might, possibly feature products like yours. Feedly gives you a brief summary of each site, so you can quickly get a good overview of what the site is all about. In the "dog" keyword search, there are several options that look promising and are worth exploring, but one really stands out. There's a website that says it is "a modern dog blog featuring pet-friendly supplies like modern dog beds & houses, dog tags & collars... " That definitely looks like a possibility! Look for several possibilities, and try a few different keywords to get a good list of bloggers who might promote your shop. They won't all be winners, so you need to start out with a decent list. I'm going to stick with just one option here, though, to keep the explanation simple. Next, you need to check out your possible websites to see if they truly are a good fit. Navigate over to the first potential partner you want to explore, and check out their site overall. When I go over to the example dog site I've found, I see it's an entire blog dedicated to nothing but dog products. It's still looking promising, but I wonder if they promote products in Etsy shops. If you want to know if the blogger you're researching has ever promoted other Etsy businesses, just find their site's search bar, search up Etsy. See if you get any results, and check out those pages. Still on the dog product website I found on Feedly, I find their search bar, and type in Etsy, and up pop several results showing dog-related products in Etsy shops they have promoted. Awesome! If you're the seller handmade dog bowls I mentioned earlier, now you have good evidence that they will consider promoting the dog-related products in your Etsy shop. Don't give up on a blogger if they are a great fit, but they haven't promoted any Etsy shops. It might be more of a long shot to grab their attention, but if it's truly a good fit, it's worth getting in touch with them. Once you've found a few bloggers in your target market who might promote items in an Etsy shop, you want to make sure the person you're thinking of partnering with has good traffic to their blog. Based on my experience on the affiliate end of affiliate sales, I can tell you, it takes a lot of traffic to make a few sales. A blogger who is willing to feature you on his or her blog might ask you to do a lot of the work in preparing the piece. They might ask for original photos, and you might need to provide answers to some interview questions. All of this work is worth your time if the blogger has a large audience. If their audience is tiny, the exposure won't likely help you much. Luckily, I've already posted an article explaining how to research possible business partners! When you're on that page, look for the heading "Check Out Their Website Traffic." That section is particularly relevant here. Use the tools described on that page, particularly Alexa or SemRush to get a good feel for how large a blogger's audience is. I'll use Alexa.com in the example we're working through. I'll give you a quick background on Alexa, so anyone who is not familiar with it will know what I'm talking about. Alexa.com is a tool you can use to estimate how big a website's audience is. While it not perfect, in general, the lower a site's Alexa number is, the more traffic that site gets. There are approximately 200 million active sites online, which means a site with an Alexa ranking of one million is in the top .5 percent of all websites. That's impressive, and, while it's not a guarantee, any blog in your niche with that kind of traffic (or more) has the power to get interested customers to your Etsy shop. When I go to Alexa.com and check the traffic for the example dog product site, I discover their audience size is very impressive. Their Alexa ranking is around 500000, which is excellent, and a good indication that they have a significantly large audience. If I had an Etsy business selling dog-related products, I would definitely think it was worth my time to work on a partnership with a blogger like that. If a blogger with that kind of audience in your niche featured your product, you'd get in front of a lot of people. Now that you know how to find potential partners who might be interested in featuring your Etsy business on their blog, you need to know how to contact them to make the best first impression and increase your chances of making a connection. Luckily, I've written a couple of articles on that topic, too! Here's how to make your contact with bloggers, so they will actually read (not just ignore) your message and consider your proposal. And, if you want to get on a popular blogger's radar and build up a bit of a relationship with them before you contact them with your proposal, you'll find tips on doing that here.